As regular readers will know, I love planning my Walt Disney World holidays almost as much as I enjoy being there. During our holiday the WDWtoday Twitter account (the official parks Twitter account) was celebrating its 2nd birthday and I happened to get into a conversation with them to wish them a Happy Birthday letting them know that we would be in Magic Kingdom that day. 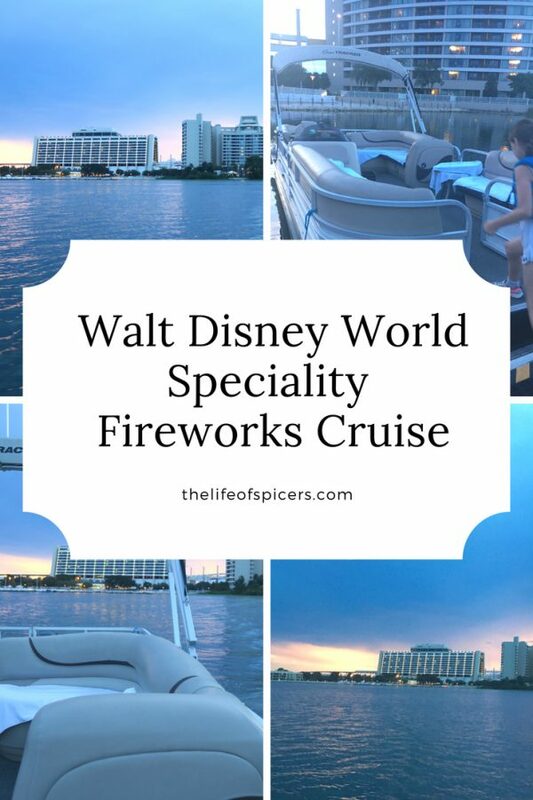 On the day we were due to travel I received a message asking us if we would like to celebrate their birthday with them by enjoying a Happily Ever After fireworks cruise. 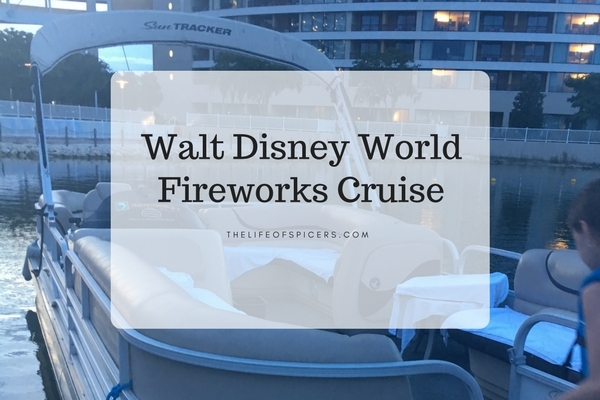 If you’re wondering about the best place to watch Magic Kingdom fireworks outside the park then I can highly recommend the speciality fireworks cruise. 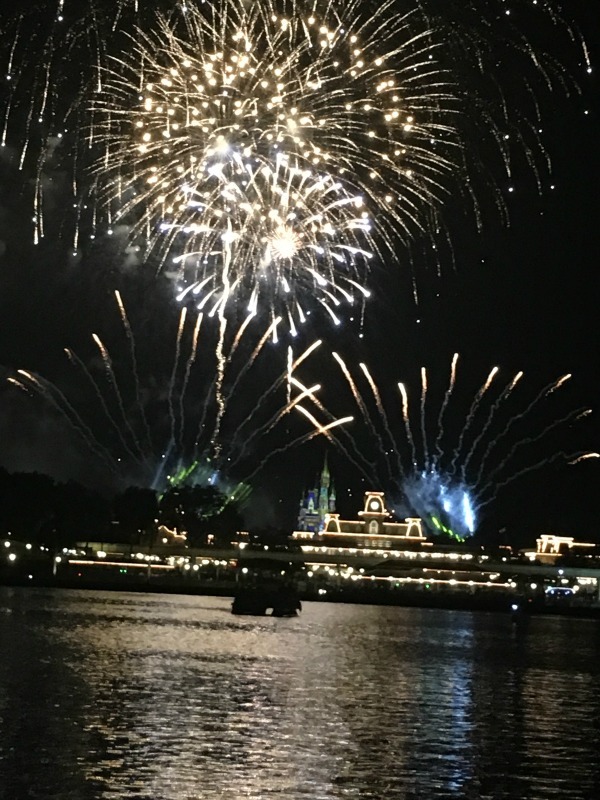 In my Disney research in the past, I had briefly read about Magic Kingdom fireworks cruises on Bay Lake and Seven Seas Lagoon, however booking one had never been in my plans. We were very excited to accept the generous offer, and looked forward to meeting the Twitter team and celebrating their birthday with them. Happily Ever After fireworks in Magic Kingdom is new for 2017, and we had planned to watch the show from Magic Kingdom during our second day of the holiday. By the time the Happily Ever After fireworks cruise arrived we had already seen the show, so we were looking forward to watching it again from a different perspective. Our Happily Ever After fireworks cruise set sail from the Contemporary resort 75 minutes before the fireworks were due to start. We met the lovely Twitter team on the marina at the Contemporary resort, and had a lovely chat as they told us about their day they had spent celebrating their birthday. I wasn’t really sure what to expect from a Disney fireworks cruise, but I was excited to get going none the less. I thought perhaps there would be a large group of us enjoying the Happily Ever After fireworks cruise together, but it turned out to be just us, which was amazing. We had a great skipper for the evening who spent the time telling us lots of stories about the sights we saw as we toured the lake. Speciality fireworks cruises also set sail from the other Magic Kingdom resorts. We spotted the Wilderness Lodge, Polynesian Resort, Fort Wilderness, The Grand Floridian, Discovery island that was in operation before Animal Kingdom was built, and we even say the old water park River Country. It was amazing to see so much and learn so many Disney facts that we wouldn’t have learned otherwise. There were other boats out on the water, including the Grand 1 yacht which sets sail from the Grand Floridian resort. The Grand 1 begins at a cost of $349 per hour, so it would be a truly special experience to be onboard this yacht. We also spotted some Pirates and Pals cruise boats that sounded like a lot of fun. As the sun wet, we arrived in front of the Magic Kingdom to some amazing views of everything lit up. 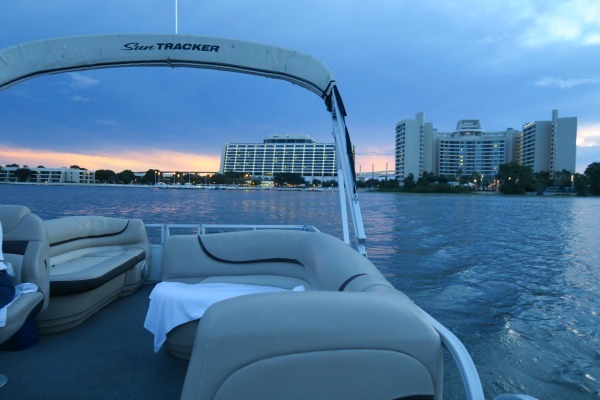 Our boat, a 25′ Tracker Pontoon seats up to ten guests. On board the boat there was so much attention to detail for the guests, including plenty of towels to use as blankets if needed, a tray of snacks and cooler of drinks provided. We also had the music from Happily Ever After piped into the boat when the fireworks started, it was amazing. I think we were all a little in awe of the show happening in front of us. A Disney World fireworks cruise is such a different and amazing way to watch the Magic Kingdom fireworks, and I would highly recommend it. 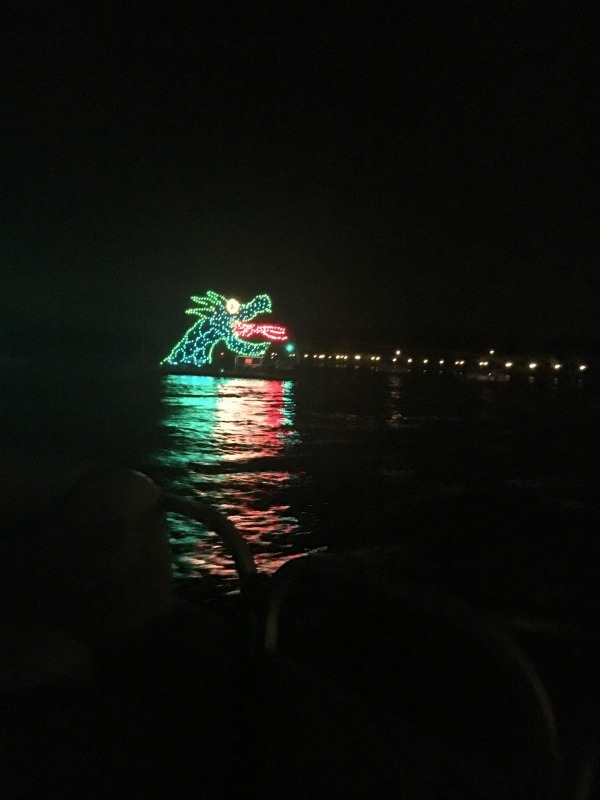 I don’t know where the time went, but it flashed past so quickly, however before we made our way back to the Contemporary Resort, we were treated to watching the Electrical Water pageant that travels around the resorts on Bay Lake and Seven Seas Lagoon every night. We’ve often spotted this in the distance as we’ve been walking back to the busses leaving Magic Kingdom, but we were so close to it on the water it was amazing. We were safely delivered back to the Contemporary resort a little while later with big smiles on our faces. Whilst I hadn’t considered booking a fireworks cruise in the past, I wish I had read a little more about it, as it truly was a unique and wonderful experience. Speciality cruises can be booked for many occasions, and we saw a surprise boat with balloons tethered to it whilst on our Happily Ever After Fireworks Cruise. 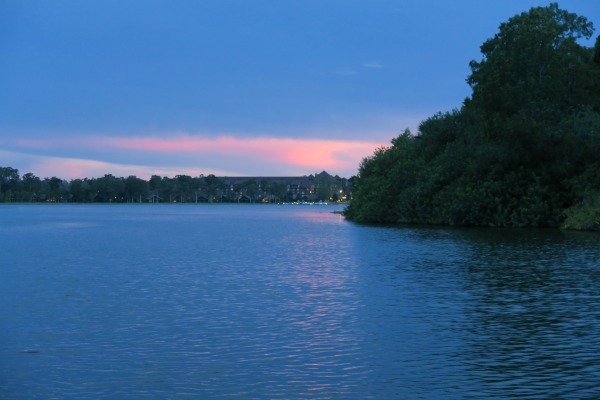 A speciality cruise costs in the region of $349 plus tax on a 25′ Tracker Pontoon. If you break that down per person then it works out good value for money for a celebration. 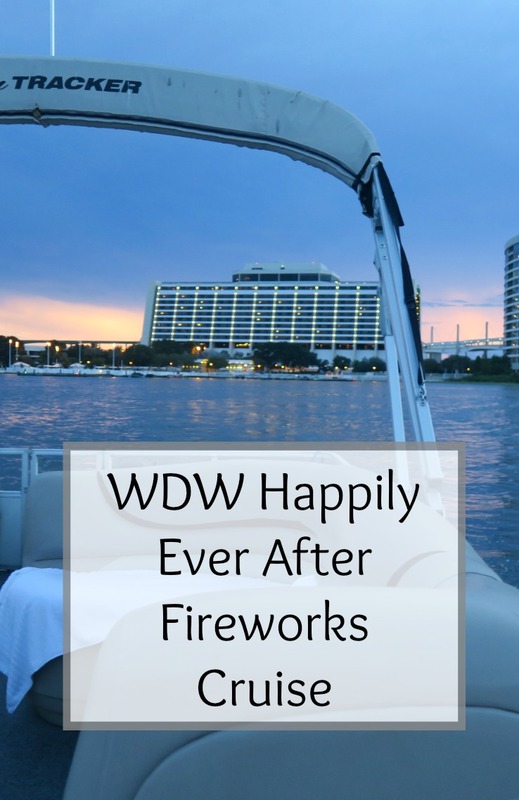 Whilst we were gifted this Happily Ever After fireworks cruise from the WDWtoday Twitter team we weren’t asked to write about it, however I wanted to share our amazing experience with you all. It really has proven to be one of the best places to watch Happily Ever After. Oh wow what an experience! This sounds like the perfect way to watch fireworks.